Outline plans to build houses on the site of a Northumberland sawmill have been given the green light. Applicant Stan Dawson was seeking permission for up to nine homes on around one-third of the Kirkley Sawmill plot, which lies to the west of Northumberland College’s Kirkley Hall campus, as he is retiring and intends to close the business. Concerns about unresolved flooding issues had led councillors to defer a decision at the February meeting of the Castle Morpeth Local Area Council, which also allowed members to go on a site visit. But following the outstanding matters relating to surface water being resolved, the committee approved the scheme by three votes to zero, with two abstentions, at its meeting on Monday (April 8). This was despite hearing concerns for a second time from neighbours Christine and Glenn Brownlee, who were backed by Coun Christine Caisley, from Ponteland Town Council, which opposed the development. Mrs Brownlee complained that the proposals would ‘just about annihilate a small country hamlet’. Councillors were told that a condition on the approval would mean that the other two-thirds of the site would have to be cleared and soft-landscaped before any of the new homes were occupied. 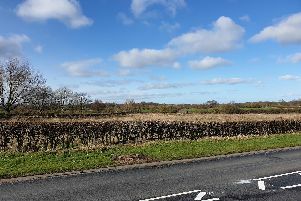 In response to questions from members, the council’s director of planning Rob Murfin explained that while anyone can apply for planning permission for anywhere, there is ‘plenty of case law’ saying that once a site has been re-greened then it is no longer a brownfield, or previously-developed, site. Therefore, given the site’s location in the green belt, it would be far more difficult to obtain permission to build on the other plot of land. At the February meeting, the applicant’s agent, Chris Megson, from ELG Planning, said that they had ‘worked closely with officers to develop a quality scheme’ which ‘fully addresses the opportunities and constraints presented’. He added that the housing proposals, if approved, would represent ‘a far more sensitive and appropriate use in the green belt’. Planning officer Geoff Horsman said that questions around the sustainability of the location had to be balanced against its status as a brownfield site coupled with the fact that the site benefits from planning permission for unrestricted industrial use with no planning conditions limiting hours of operation, for example.